In the forecabin. This was taken at a boat show, so the kids have been looking at the Porta-Potti hidden under that center cushion and have replaced the cushion reversed so the plaid doesn't match. African mahogany trim and plywood highlight the Douglas Fir frames and stringers. 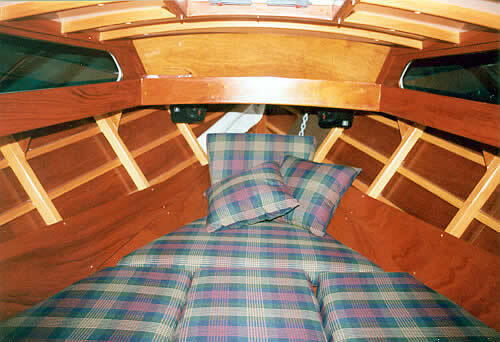 The plywood berth ceiling panels create a chimney effect and keep dry the cushions and effects stowed under the berth. In the same cabin, but on a cruise. 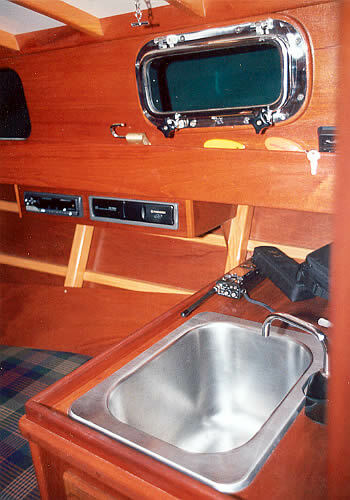 The owner's handheld VHF lays beside the deep SS sink and we see the owner's cabin lock and boat keys on the little shelf/handhold/water catcher which runs along both sides of the cabin. We put in a little stereo system for tunes while relaxing. The cabin top interior is also painted with Awlgrip, which looks nice against the varnished Douglas Fir beams. On the port side, we have located a 2-burner wick style alcohol stove. It makes a fine pot of coffee or a full dinner. Now we are out in the cockpit. 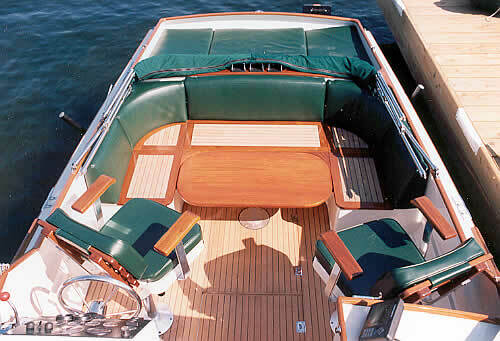 Here we have a teak ladderback seat with custom cushions and a steering console with storage under. 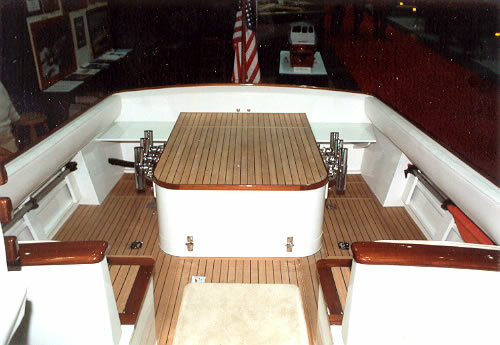 You also can see a portion of the teak windscreen and mahogany paneled companionway doors. The pedestal seat sits on a slider, so there is ample room and good visibility either sitting or standing. This cockpit arrangement works well for a family. There is lots of seating close together. 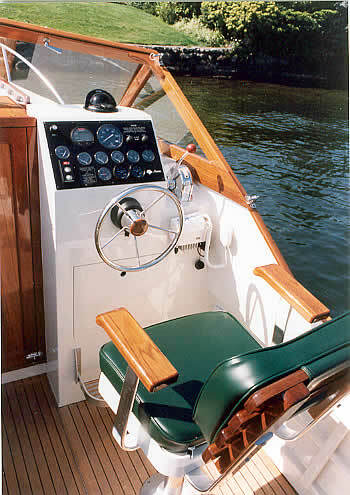 The elegant teak seats and self-bailing cockpit sole are built from real teak planks, not cheap plywood. The emphasis is on beauty and durability. The teak in this boat is either varnished or oiled. 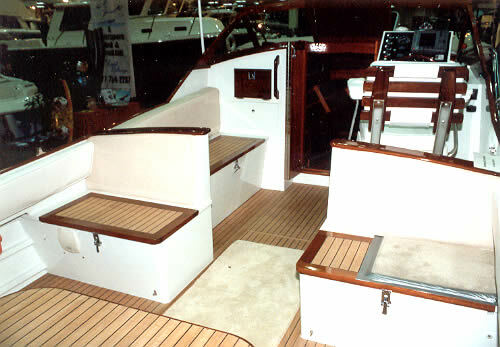 This client opted for teak ladder-back seats and vinyl upholstery, and twin consoles forward of the pedestal seats. The cockpit table is shown with the leg stowed, in the berth position. The kids can sleep there and on the engine compartment cushions, under canvas, when cruising. This client chose to varnish the seat borders, trim and table, and leave the rest of the teak bare. Here's the same boat with the table on its leg and swiveled to an "entertaining" position. Here's a totally different cockpit arrangement. This was taken at a boat show; please excuse the rugs. We normally allow no carpet in our boats. 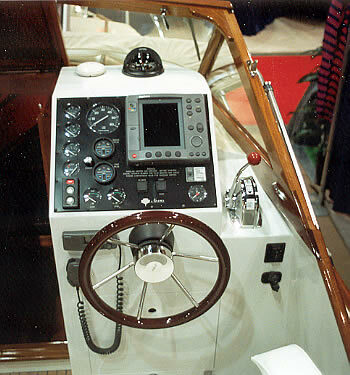 This cockpit is in a boat with a triple mission: offshore sport fishing, family cruising, and water skiing with kids and friends. The owner reports great success in all these missions. So we see an engine box sporting six removable rocket launchers and walkbacks on each side of the box with removable seats against the transom. 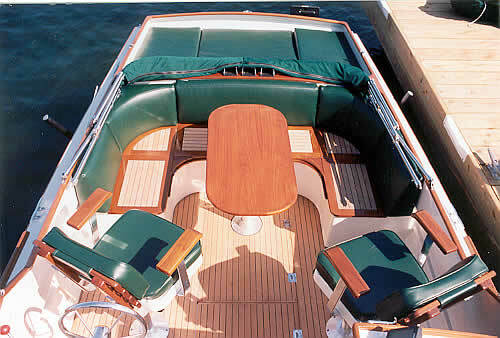 The aft facing seats carry family, observers, or fishers. Like in all our self-bailing boats, virtually the entire cockpit sole consists of watertight hatches. Looking forward in the same cockpit. There's a ladderback pilot's chair, with a family seat opposite where mom can keep the younger kids close. 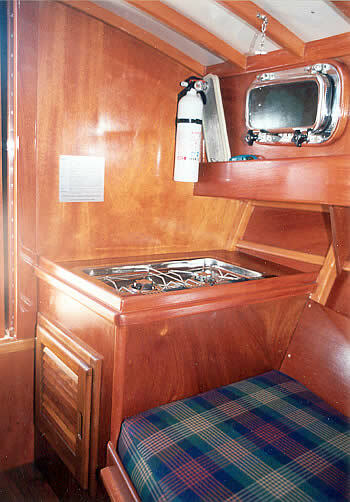 The starboard seat locker serves as a custom ice chest, while the port seat has a backup manual bilge pump, just in case the two 3500gpm electric pumps become incapacitated. 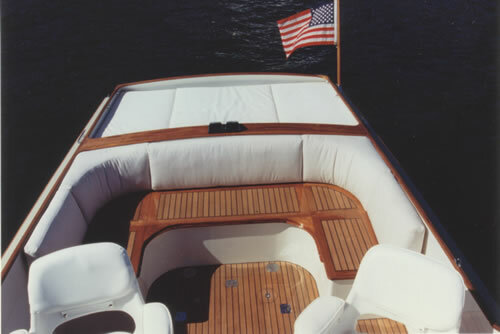 Again, the sole, engine box top, and seats tops are made of teak planks vacuum bagged down onto a plywood substrate, glued down in epoxy and the seams filled with epoxy and graphite to simulate the old-fashioned caulking seams. Again, the ugly carpet is for a boat show. The carpet does allow me to bring up an interesting point. Notice how it is duct taped down to the teak and varnish? There also is other carpet duct taped to the deck paint. When the show is over, after a thousand or so people have stepped on the carpet and duct tape, we just rip it off. No damage, no sign it was ever there, just another testament to the usability of our boats. These are not museum pieces, but rather very desirable, very user-friendly vessels.